Regulatory compliance specialists help to ensure that companies are following the set regulations for their industry. Without such individuals guaranteeing that a company is in line, liability or other legal issues could arise. 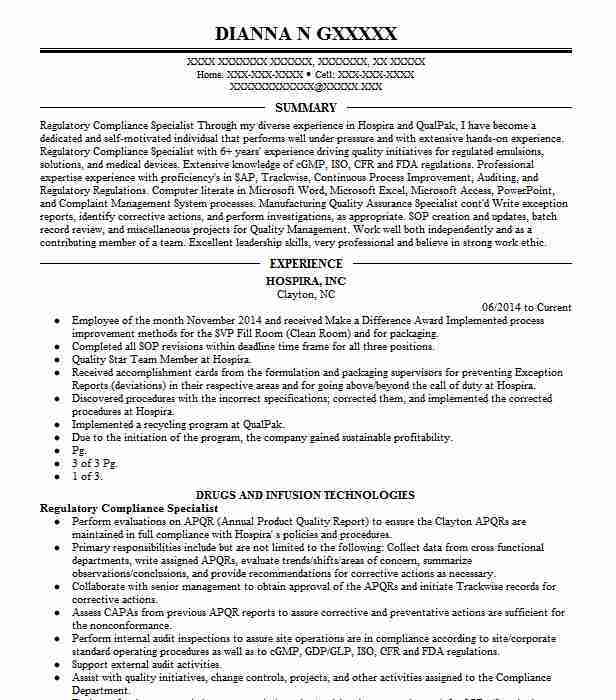 When applying for such an important position, it is critical that you have an exceptional objective statement to set you apart from the competition. These specialists have a number of different duties, including gathering and evaluating information, altering and monitoring compliance practices, communicating with various management professionals, and properly utilizing and executing computer programs. Seeing as all of the duties of cannot fit in one objective statement, it is your duty to choose the qualities that you believe best showcase your skill set and present them in an intriguing manner. You want to eliminate any doubt that you would be able to fulfill the position. A proper objective outlines the key skills of an individual in a clear and concise manner. 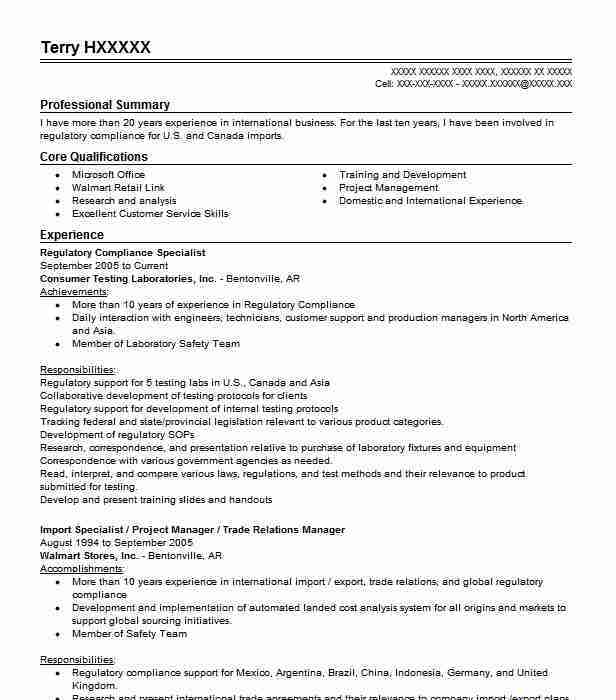 For those looking to customize the resume to the particular employer, adding the company’s name is a great touch. 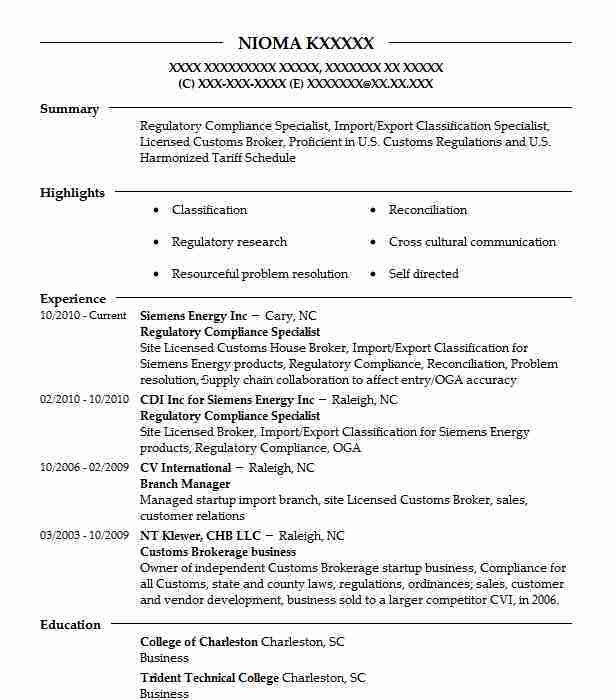 Take a moment to review these sample regulatory compliance specialist resume objectives. 1. Desiring to apply strong industry knowledge, management experience and analytical skills, along with development and implementation abilities, in a regulatory compliance specialist position with ABC Company. 2. 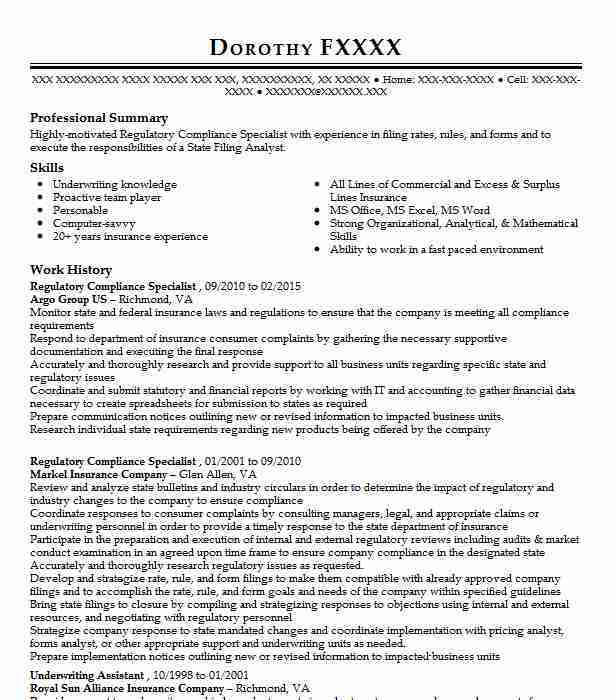 Accomplished regulatory compliance specialist with over X years of experience looking to contribute excellent management and problem solving skills in a position with a reputable company. 3. Goal oriented compliance specialist seeking to advance within ABC Company and continue to apply analytical and developmental skills, as well as issue resolution abilities, as a regulatory compliance specialist. 4. Management professional with a strong track record of developing and implementing efficient projects seeks to secure a regulatory compliance specialist position with ABC Company. 5. Recent business administration graduate with X years of management experience and possessing excellent organizational, analytical and writing skills, looks to secure an entry-level regulatory compliance specialist position with a respectable organization. Regulatory Compliance Specialist @ Consumer Testing Laboratories, Inc.